A long love affair with Guatemala has led to many difficulties and rewards for guest columnist Paul Heesaker. He shares his story and explains how his experiences have led to a new vision for aiding conservation and humanitarian efforts there. Paul has a dream. He dreams of a camp and some cabins. He dreams that he can buy the land, build the camp and cabins and hire local Indians to run it. He has a dream that he can turn it over to the Indians. He has a dream that the native Indians may see that there are more ways to profit from their beautiful homeland, besides slash and burn agriculture. He is realistic and understands that, at the moment, the locals have little choice but to do what is required to feed and raise a family. Right now that means slash and burn to raise corn or to graze cattle. But Paul has more than a dream. He has invested several thousands from the meager earnings of A.V.E. in what he calls the Semuc Champey Project. Paul is like a salmon swimming upstream. But I think he has a chance. 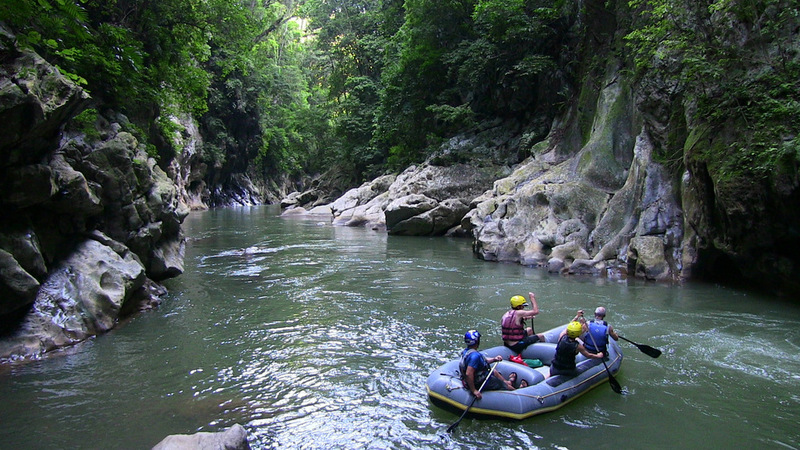 The Rio de los Esclavos, first explored by the author’s company, Area Verde Expeditions, in October 1994. I’m drawn to Guatemala like Odysseus to the sirens’ song. My love affair with the country began with the desire to lead a big and bold life, to build an international whitewater business, to bag first descents and guide adoring customers, and even to save the rainforest while I was at it. Those ambitions have led me down a path that’s been both harder and more rewarding than I ever imagined. The Rios Ecological Center will be located near the entrance to the Boqueron Canyon. This excerpt from a 1994 AVE newsletter captures the spirit of those early days and the scope of my ambitions: Those of you who have traveled with AVE know of the severe poverty among the native people and the destruction of the rainforest in the Cahabon River valley. 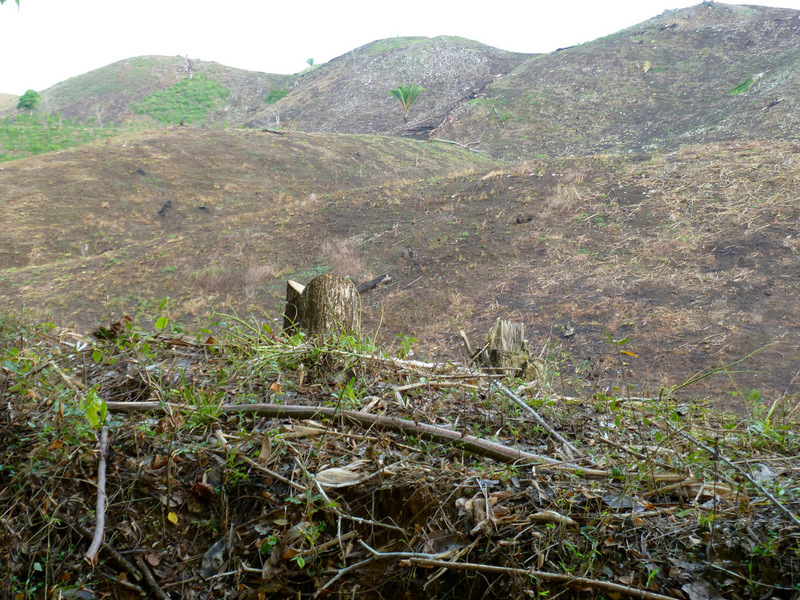 Poor farmers have no choice but to slash and burn the rainforest. They need to raise corn and beans to feed their families. We would do the same. A cycle of poverty, malnutrition and rainforest destruction goes on generation after generation. Area Verde Expeditions is working to alter this cycle of poverty and destruction. When funds are available, we will begin construction of an eco-camp at Semuc Champey and channel tourist dollars into job opportunities for the Q’eqchi Maya. The camp will consist of a tenting area, cottages, dormitories and a lodge / restaurant. Trails will provide access to viewpoints. An organic garden will provide fresh fruits and vegetables for the lodge restaurant and a model project in sustainable agriculture. Slash and burn agriculture and cattle ranching are Guatemala’s leading causes of deforestation. I quickly discovered that naïveté and hubris don’t fare well in the developing world, however. 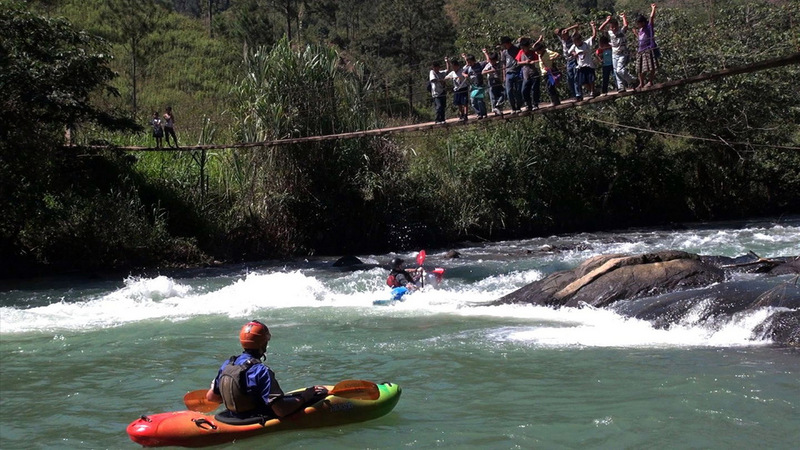 Any U.S.-based river company faces risks, but doing business in Guatemala added exponential factors to those risks. I overlooked an ongoing civil war, minimized political, historic and cultural complexities, and, in the end, was blind to the poison within my own company. I was in Colorado when I received a call from Roberto Rodas, an AVE guide and my go-to-guy for first descent plans. He delivered devastating news. Money, office equipment and expedition gear had gone missing. All that remained was unpaid bills. This betrayal from within, by an American river guide, pushed Area Verde Expeditions to the cliff’s edge. An ultimatum from my wife sent it over. “Enough is enough. Either the business goes or I do.” First the business died, then the marriage. My travels and work in Guatemala have been defined by such hardships—wounds that never fully heal, but that carry hard-earned lessons. More important, though, are the cherished memories I’ve collected—seeing people connect with the natural world and watching new bonds form between different cultures. Whether enclosed in deep and verdant fissures cut through volcanic highlands or floating the fluorescent green waters of Guatemala’s Caribbean slope, I will always count those days among the best of my life. Peter Zurflieh, assistant director of the Rios Guatemala Fund, kayaks the Rio Sauce. ..And then, when the river flowed calm and straight, we sat simply bedazzled by the beauty of it: the Canyon of Lost Souls, where dozens of waterfalls cascade down cliffs hundreds of feet high: the lush jungle vines and flowers, the thousands of green tree frogs singing on the narrow banks and the cries of jungle birds as hawks swooped overhead. In July 2011, I stopped to visit Roberto, now a river guide in Colorado’s Royal Gorge. He shared bad news once again. The Guatemalan government planned hydroelectric projects on many of the country’s wild rivers, including the construction of the Xalala dam on the recently discovered and spectacular Rio Copon. 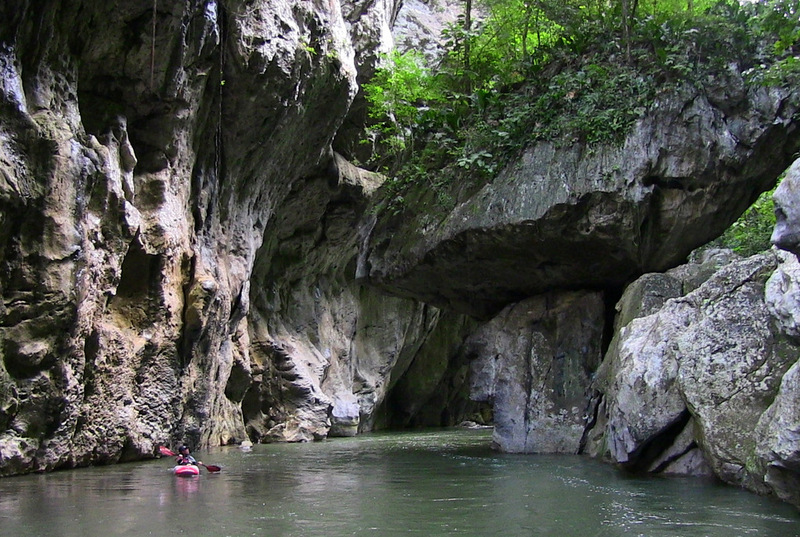 The Copon carves Guatemala’s deepest canyon and lies in the Zona Reyna, a remote region far removed from any tourist’s itinerary. 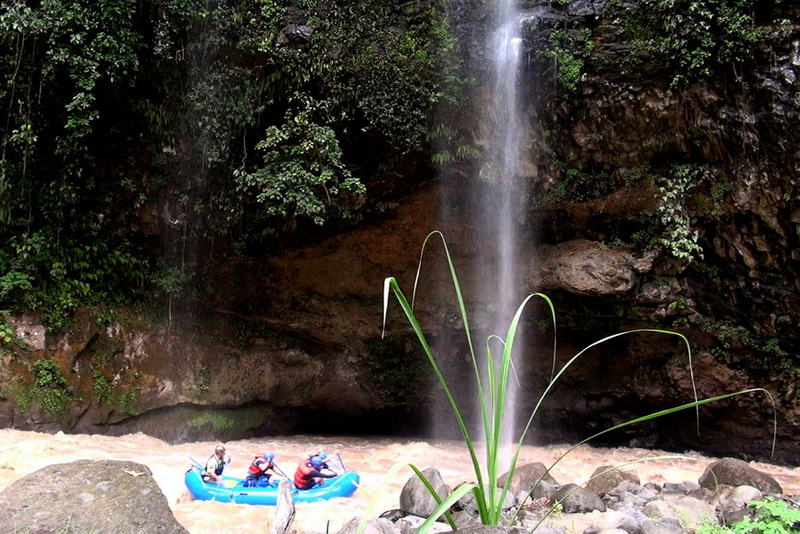 Guatemala offers whitewater paddlers an abundance of jungle rivers. This was my opportunity for closure, a chance to bury regrets and leave something more than shattered dreams behind. Two months later, I packed a camera and tripod and boarded a plane for Guatemala City. The end result was my documentary film, “Rios Guatemala, The Preservation of Wild Rivers.” The best-case scenario would be to inspire a river preservation organization. Maybe the Guatemalan government could be convinced to abandon the Xalala hydro project and see the area’s tourism potential. Many years had passed, but my idealism and naïveté remained intact. 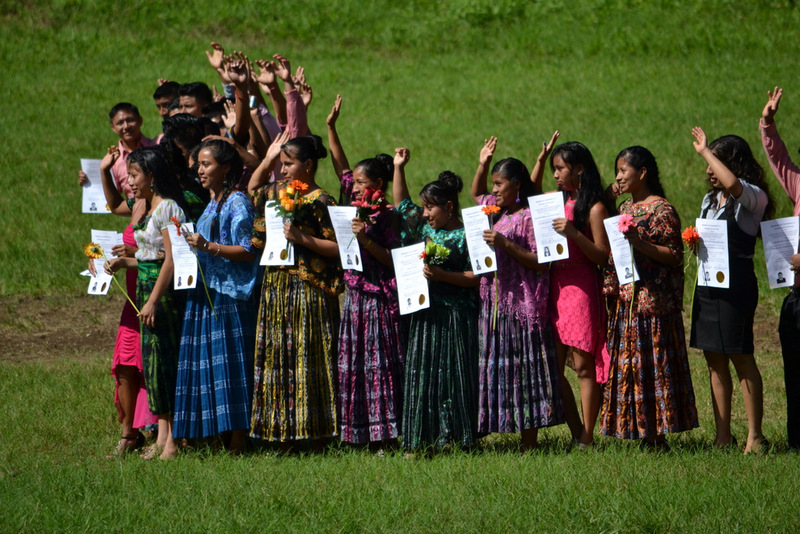 Graduation day at Ak’ Tenamit, a three year vocational boarding school that empowers Mayan youth. But the expedition never made it to the river. 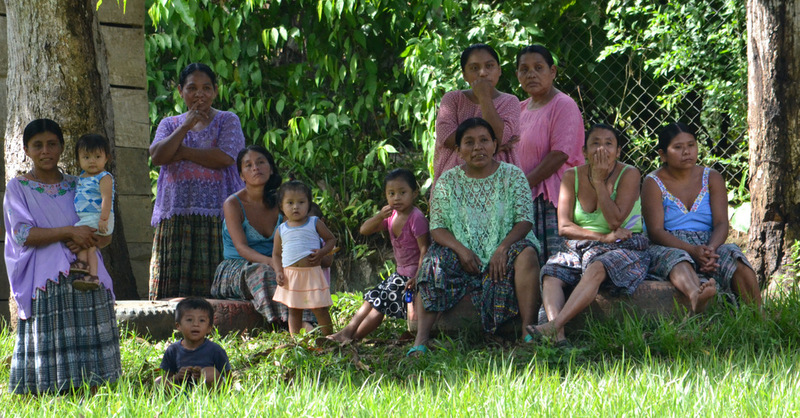 Mayan villagers suspected us of involvement in dams and mines. They held us captive and threatened our execution if we ever returned to the area. Gear was stolen, including my camera and film footage of other area rivers. Vigilante justice was always close at hand, but in the end, the threat of military intervention helped convince the villagers to release us. Even so, they refused to give the stolen items to government officials. Instead, they insisted that the gringos return to the Zona Reyna. Max Baldetty, a Guatemalan river guide who played a central role in our release and my film, joined me to return to La Zona Reyna and receive the stolen property in person. The Rio Copon incident became a test for President Molina, who promised an iron-fisted approach to improve security. It was also a chance for the local Mayan people to showcase their opposition to hydroelectric projects that destroyed their homeland. After several days of weather delays, a government helicopter arrived. It carried Oscar Mazaya, a representative of the Molina Administration, and Ernesto Galdame, a congressional leader from the Quiche Department. We lifted off and flew under gray storm clouds. I peered through the helicopter’s rain-streaked windows and down on a checkerboard landscape of cornfields cut into forested mountainsides. Steep river canyons sheltered the only undisturbed rainforest. Q’eqchi Maya women watch a soccer game in Seacacar Abajo, the site of the Rios Guatemala Fund’s new intermediate school. The helicopter approached a soccer field-landing site. I scanned the ground, expecting to see police or armed forces. Instead, Q’eqchi villagers rushed to the area. Closer. Wind whipped grass. Hands holding down ball caps or straw cowboy hats. We touched down. The copter’s rotor blades slowed and stopped. The engine whine died. I set the borrowed camcorder in my lap, unbuckled the seat belt and stepped down onto the grass. No tension. Smiles. Open arms. I pushed the camcorder record button. The same people who held us captive just days before greeted us with hugs and handshakes. Instead of a mob set on vigilante justice, we walked side by side with our former captors and gathered in a central plaza. These same speakers also used the occasion to send an unmistakable message to the Guatemalan government. Doors now open to tourists and river runners would remain slammed shut to dams and mines. I filmed a woman holding a handmade sign bearing these words: Respect us, for the defense of our territories, of our mother Earth, like women that fight for their lives and the future of their children. No dams. No mines. Max was given the microphone and spoke of the same common bond. The only thing we wanted to do was to run the river, to know the beauty and to support you, he said. I invite all of you to reflect on what happened. Let’s learn. Let’s take a new step and move forward. We want you to know that we love you. I am Guatemalan. I live looking to visit the entire family, the entire village. We are all family. We are all Guatemalans. We need to fight to protect our natural resources so that we can prepare the earth for our children. When put to the test, both while our lives were threatened and when given the opportunity to forgive and build alliances, Max showed his character. And for me, dreams left to wither and die caught fire once again. Peter Zurflieh, an invaluable ally in the effort to build the Rios Ecological Center, joins me for an early walk. We pass the lodge kitchen and I hear a familiar pat, pat, pat sound. Warm and fresh tortillas will be ready for breakfast. The Canyon Loop Trail passes through an abandoned cornfield. Soil that had been too exhausted to produce now bears banana, papaya and avocado trees. 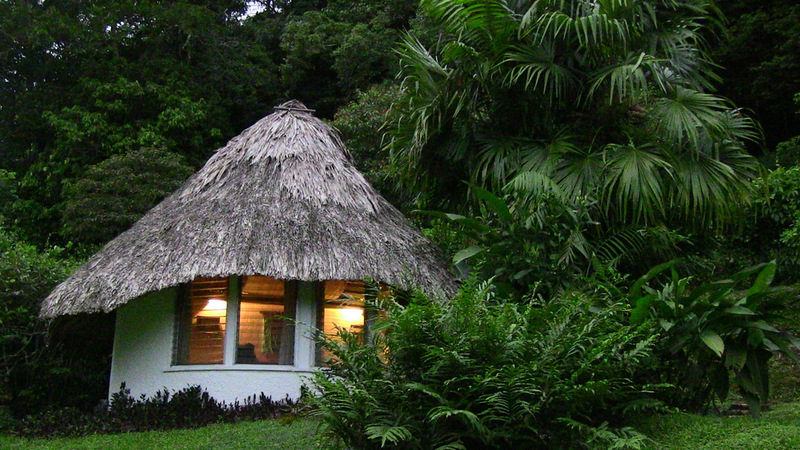 A vision for the future – one of the more upscale riverside cabanas at the Rios Ecological Center. The trail switchbacks up the steep hillside. We pause to catch our breath and enjoy the view. Riverside cabanas overlook the Rio Sauce gorge. Others are up early as well. Two volunteers, one a Taiwanese University student, and the other a retired American teacher, chat on the retreat platform, early arrivals for the morning yoga workout. 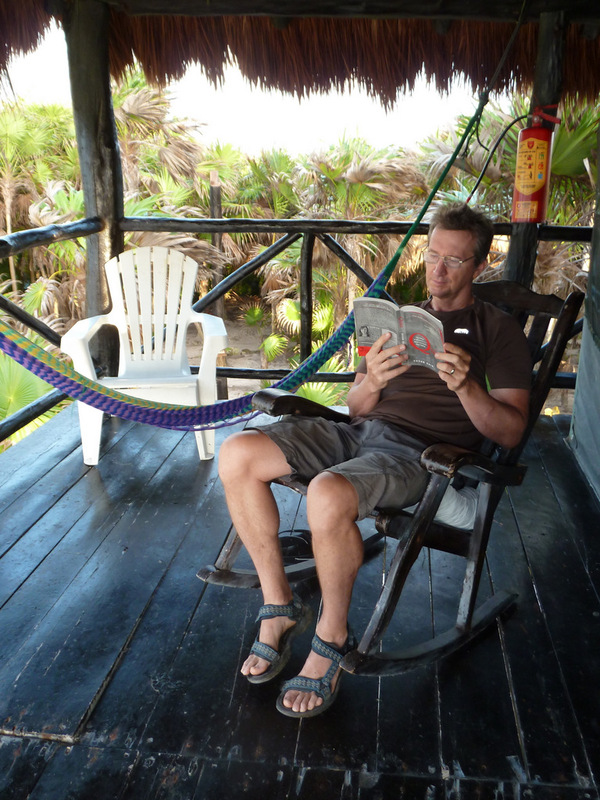 Luis, the first teacher hired at our new intermediate school, sips coffee on his cabana deck. There’s time to relax before classes begin. The orchard falls behind and the trail climbs toward the canyon rim and undisturbed rainforest. A flash of yellow, green and red flies overhead—the beak of a keel-billed toucan. We stop and listen—a guttural groan, but not the full-throated roars that sometimes wake guests up at night. The troop of howler monkeys remains out of sight and peaceful for the moment. The author shows what relaxation can look like at the proposed Rios Ecological Center.